I have been involved with Grinnell for as long as I can remember. Whether it was coming back for swimming reunions, visiting coaches, helping to plan reunions or to attend CFD training, I have always enjoyed my time on campus. I currently live in Jackson Hole, Wyoming, with my spouse Kathy and have a daughter Samantha who is studying Musical Theatre at the University of Utah. 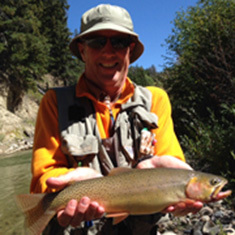 We enjoy downhill skiing, fly fishing, golfing, biking and hiking in the Grand Teton and Yellowstone area. During the long winter months we enjoy escaping the frozen tundra for the opportunity to dive, fish and play golf in exotic places. I feel it is important to give back to your community and have volunteered for many nonprofits over the years. I currently sit on the Board of the JH Senior Center and the SJ Episcopal Church Endowment Committee in addition to my many roles at Grinnell. *To access Rick's Grinnell Connect Profile, you must already be a member of the site. If you are not, register here.